Thank you so much Nancy Neal PTA! NNE PTA just purchased 20 additional iPads for the students and staff here at Nancy Neal Elementary. The students are already loving the experiences they can share with each other. 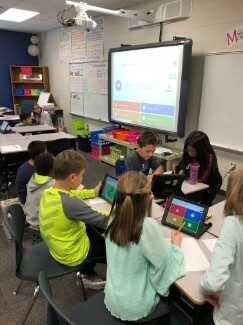 Below is a picture of Mrs. Siegel's class participating in a fun Kahoot exercise in their math classroom. We cannot thank our Nancy Neal Elementary PTA for always doing what is best for students and staff here at Nancy Neal Elementary!